Words matter, semantics matter. This self-definition is both radical and revolutionary. 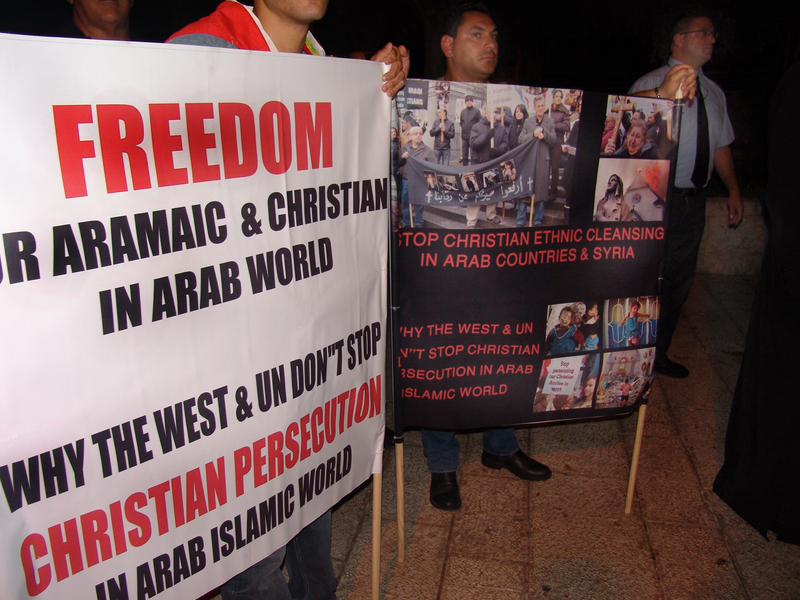 Most Christians in Israel are Arabs and traditionally they side with Arab Moslems. Some of the most infamous terrorists are Arab Christians… When Lenny and I saw the ad for the rally of Arab Christians protesting ethnic cleansing in Arab countries and in support of Israel we decided to attend. These, we thought, are people we want to stand with. What we found at the rally was much more moving and inspiring than anything we imagined. 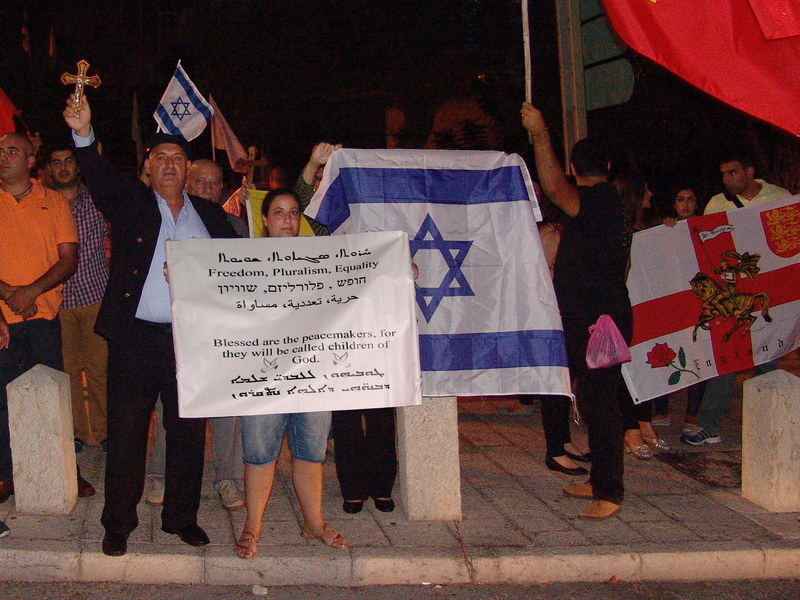 It took place at the UNESCO Square for Peace & Tolerance in Haifa. The demonstration in support of Christians was very different. Approximately 130 people attended. They were quiet, holding signs and waving flags. Israeli flags, alongside their church flags. Some of the signs questioned the world’s silence on the torture and mass murders of Christians in the Arab-Moslem world. Other signs thanked Israel for providing Christians a safe haven, freedom of religion and equal rights. Some of the attendees had their faces painted with a cross and a Star of David. Arab residents of that neighborhood watched the demonstrators from the opposite side of the street. 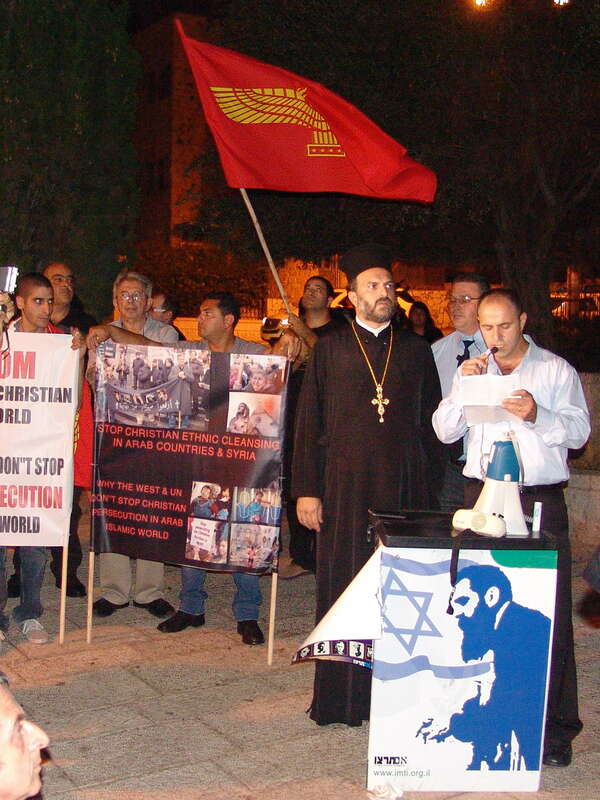 Both Christian and Moslem Arabs glowered at the Christians openly showing their support of Israel. Dozens of riot police watched from the side, ready to put a stop to any violence that might occur (unlike the previous week, this time the riot police did not have much to do and they spent their time talking to their friends and playing with their phones). Father Nadaf and the other speakers spoke about their solidarity with Israel, how thankful they are that Israel provides them with freedom and protection. They denounced the rabidly anti-Israel Arab MK’s, saying that those hateful people do not represent them. They explained that in the Middle East “goodwill gestures,” like agreeing to ceasefires while still under attack and offering land for peace is interpreted as weakness; Israel’s hyper-decency actually ends up encouraging the terrorists and endangering the people of Israel. They spoke of the need to fight Islamic Jihad in all its forms and how Israel must defeat Hamas before the threat increases. They reiterated their support for the IDF and prayers for the safety of the soldiers while they get the job done. It takes great courage to stand up and say these things in public. Father Nadaf, as a prominent religious figure and head of a community put himself in danger by being the spokesman for these ideas. It is very telling that although the police were there to protect the demonstrators, Father Nadaf had his own private bodyguard, literally watching his back. At one point a Christian Arab young woman who had enlisted in the IDF showed up in her uniform. The Arabs watching the demonstration started shouting at her, calling her a traitor, saying that she should remember that she is a Palestinian, not an Israeli. At this point the police intervened to protect the young woman from the angry crowd. Semantics matter. The people who define themselves as Arabic speaking Israeli Christians do so to differentiate themselves, to show that for them, the Christian values are more important than Arab culture. They call themselves Israeli, not Palestinian and they are thankful for the freedoms this country has granted them. Those who call themselves “Palestinian” are not pointing out a cultural-historical fact – they are making a political statement. This rally was small but it gave me hope. This was the first time Lenny and I had heard Christians in Israel stand in public and loudly announce their solidarity with Israel. Father Nadaf is a courageous man who has suffered a lot for advocating support of Israel and full integration in to Israeli society (enlisting in to the IDF is a major first step in this direction). The people he leads are a voice of sanity, of true moderation and plain common decency that is all too rare in the Middle East and for that matter, in other places around the world as well. People that want to live in a modern western culture, that uphold values of morality, protecting the weak, denounce terrorism and murder and appreciate the people and country that provide them with protection and freedom are people we can stand with. God bless Father Nadaf and all those who believe as he does. I wish the safety and freedom of Israel could be extended to all the abused Christians throughout the Middle East. The atrocities occurring seem to interest very few (maybe because Jews cannot be blamed?). The world must not remain silent. As the terrorists sometimes say: “First the Saturday people (i.e. Jews) and then the Sunday people (Christians)”. Just because you are not Jewish or you live far away doesn’t mean you will be immune from these problems. I hope that people everywhere will hear Father Nadaf’s words and not allow fear to prevent them from standing up for what is right. It is the silence of good people that allows terrible things to happen to us all. I hope to hear of more and more “Arabic speaking Israeli Christians”. Their voice could be the game changer for the entire region. @ArabicSongs you are welcome! Pls take a look at more, you might find other peices that interest you. Comments & feedback are welcome! thank you very much! I will be sharing and recommending this post to my blogging friends.